Steven Mithen, Deputy Vice Chancellor of the University of Reading, and author, writes about cognitive fluidity in an essay titled Out of the mind: material culture and the supernatural in Becoming Human. (2009). He discusses two cognitive developments which resulted in religion and art; the emergence of cognitive fluidity and the extension of the human mind beyond the brain into ‘material culture’. My interpretation of this is the human ability to change and modify though across domains. In reference to interactive text and symbol manipulation, it is worth reflecting on how writing slowed down cognitive fluidity by making nodes more fixed and did not allow for flexibility in their rearrangement. 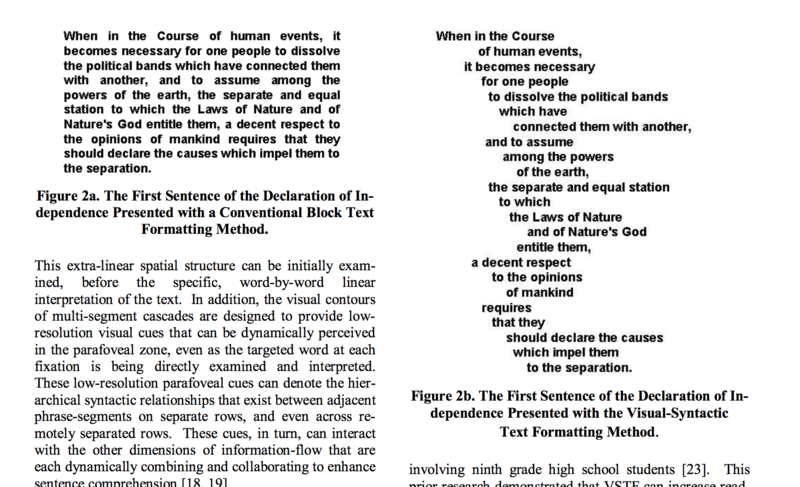 Visual-Syntactic Text Formatting (VSTF) algorithms first analyze, then reformat a sentence into cascading patterns that cue syntactic structure and assist visual- processing. VSTF was evaluated in yearlong, classroom-based, randomized controlled trials, with in-class reading sessions (25 minutes per session, twice a week), using electronic textbooks for high school students. Pretest- posttest analysis showed that, in each grade, VSTF students had significantly higher scores on nationally standardized (and conventionally formatted) reading proficiency tests over controls; effect sizes ranged from .41 to .69 standard deviations, and the one-year growth in reading proficiency with VSTF was equivalent to 2 to 3 years’ of additional growth in study and national controls. VSTF groups also significantly increased scores, with medium effect sizes, on standardized quizzes and exami- nations for comprehension and retention of the material in the textbooks. A wide range of neurocognitive, linguis- tic, and psychological research affirms that an important dimension for the representation of meaning in natural spoken language is syntax. However, syntax is more complex than a simple, concatenated sequence of one phrase after another; rather, it is hierarchical, much like a set of Russian dolls, in which smaller dolls, or phrase- groups, are “nested” inside ever-larger ones. The human mind’s capacity to build sentences through the recursive process of nesting language units inside other units, and thereby transforming them, is the essential feature that enables human language to represent an infinite number of meanings. When natural language is spoken, it is produced, perceived, and interpreted as a linear structure — through time — which limits its capacity for conveying the multi-dimensional, hierarchical structures of syntax. Nevertheless, this linear structure can be enriched with prosodic cues, which in turn can denote syntactic relation- ships to enhance the efficiency of a listener’s comprehension of a spoken sentence. Prosodic cues, (In linguistics, prosody (from Ancient Greek: προσῳδίᾱ prosōidíā “song sung to music; tone or accent of a syllable”, is concerned with those elements of speech that are not individual phonetic segments (vowels and consonants) but are properties of syllables and larger units of speech. These contribute to linguistic functions such as intonation, tone, stress, and rhythm. wikipedia) which give speech a highly differentiated acoustic structure beyond the acoustic representations of the words themselves, are more subtle and multidimensional than the simple pauses that occur at major phrase boundaries, and have been shown to be powerful enough to enable listeners to accurately predict the syntactic categories of about-to-be uttered phrases, based on prosodic patterns leading up to the not-yet-uttered phrase. Up to the present time, the transcription of natural language sentences has also been linear. Within such linear scripts, some specific cues, (such as punctuation marks), denote syntactic boundaries; some (but not all) of these punctuation marks correspond to pauses and prosodic variations in spoken language.However, when sentences become longer and more complex, working memory is overloaded, and the effi- ciency of comprehension can break down.